Cellist Joshua Morris was named the winner of the 2016-2017 Golden Violin Competition held Sunday, October 30th in Pollack Hall. Morris, accompanied by Karsiri Laothamatas, performed Kaddish, from 2 Mélodies hébraïques by Maurice Ravel, a work composed by Morris himself, Suite for Solo Cello, and the Prokofiev Sonata for cello and piano in C major, Op. 119. The other finalists in the evening's performances were Carmen Bruno, cello, Juan Sebastian Delgado, cello, Elizabeth Skinner, violin and Teresa Wang, violin. "It means a great deal to me to win this award, and it's amazing that the school has such a prestigious competition for its string players. The previous winners have been wonderful ambassadors for the University, and I'm honoured to be a part of that," said Morris. The Golden Violin Prize includes a $25,000 cash award, performance opportunities in Toronto and Montreal, career coaching sessions with Andrew Kwan of Andrew Kwan Artists Management Inc, and a replicate 14k gold pin in the likeness of the Golden Violin. The six member jury for the finals, chaired by Prof. Douglas McNabney, included Mark Fewer, Denise Lupien, Scott St. John, Jean-François Rivest, André Roy, and Andrew Wan. Morris is currently pursuing a Master’s degree in Cello Performance where as a student of Brian Manker. He previously studied with Amir Eldan at Oberlin Conservatory, where he received his Bachelor’s degree. In 2016 Morris became the 12th winner of the Jeunesses Musicales Peter Mendell Award, given to top string players studying at Quebec universities. As a member of the Milton String Quartet, he has been a semifinalist in the Senior String Division of the 2016 Fischoff National Chamber Music Competition, as well as a participant in the 2016 McGill International String Quartet Academy. Since he began his studies at Schulich, Morris has also been a finalist in both the 2015 Classical Concerto and Chamber Music Competitions, and has performed Mendelssohn’s Octet as part of the school’s Musical Chairs Chamber Music Festival with members of the New Orford and Amber Quartets. Previous accomplishments include performing on Oberlin Conservatory’s Orientation Recital Showcase and Oakton, VA Recital Series, as well as attending Masters Music Course Japan in Yokohama and Aspen Music Festival. 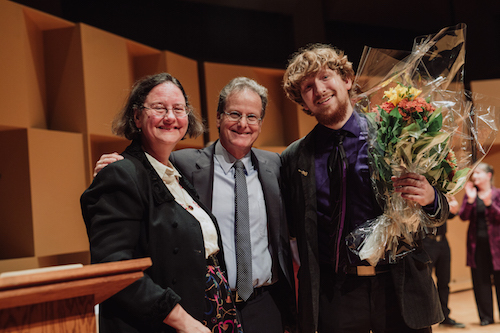 As a composer, Morris’s Suite for Solo Violin was performed on Oberlin Conservatory’s 2015 Dannenberg Honors Recital. He is a native of Saint Albans, Vermont. Past winners of the Golden Violin Competition are Emmanuel Vukovich, Lambert Chen, Chloé Dominguez, Aaron Schwebel, Ewald Cheung, Isaac Chalk, Baptiste Rodrigues, Victor Fournelle-Blain, Byungchan Lee and Joshua Peters.